Forget a Roku streaming video box: this year the company is building its famous video streaming service directly into televisions. Smart TVs with Roku's Internet video streaming service -- dubbed Roku TVs -- will go on sale this year, eliminating the need for a streaming video box. Six TV makers will release Roku TVs with screen sizes between 32 and 55 inches, said Roku CEO Anthony Wood in an interview. "It's a TV ... based on our software," complete from the user interface all the way down to the remote control, Wood said. TCL and HiSense will be among the first to sell Roku TVs, and will show models at International CES in Las Vegas this week. "We don't expect these TVs to be expensive," Wood said. The Roku TVs could appeal to those who rely on streaming video for TV entertainment, or those who want to cut cable bills. 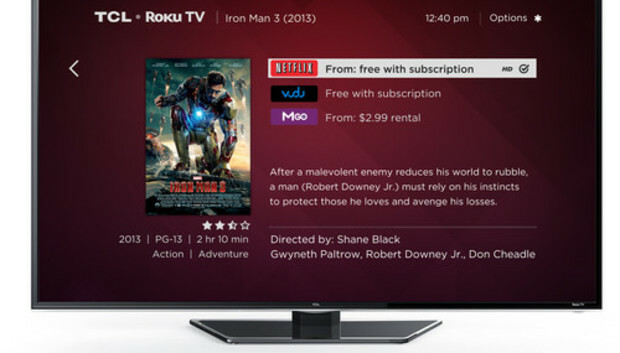 Sony, Samsung, LG and others offer their own versions of smart TVs, but Roku provides the largest catalog of 1,200 channels. Roku last year streamed 1.7 billion hours of content, up 70 percent from 2012, Wood said. Its video streaming players are priced between $49 and $99, and last year it shipped around 8 million units. Turning on the TV will load the Roku homescreen, similar to the one on the company's Roku 3 streaming boxes. Channels available will include Netflix, Hulu Plus, Disney, PBS and a host of news, movies, sports, kids and international channels. However, some channels like WatchESPN and Disney are accessible only with subscriptions to specific content providers such as cable companies. The TVs will have the usual connectors like HDMI to attach cable boxes and game consoles. Specifications like resolutions, screen sizes and refresh rates for the TCL and HiSense TVs were not available. The remote control will be half the size of regular TV remotes. But it will have volume and channel buttons, which are not on Roku 3 remotes, Wood said. "The integrated TV will be the more common way to get Roku," Wood said. "One of our goals is to bring this to a bunch of brands." Roku TV partners TCL and HiSense may not be as widely known as Samsung or Sony, but budget TVs from those companies are becoming popular, Wood said. Roku reached out to larger TV makers, but those companies are heavily invested in their smart TV platforms and won't abandon them anytime soon, Wood said. With the growing popularity of streaming content, Wood hopes the new products will provide a new way to watch TV. Millions of users already access Roku's service, and many developers are writing applications for the Roku interface. "I think the TVs are going to consolidate around [Roku] OS," Wood said. The release of Roku TVs won't upset the company's streaming box business, which Wood expects will also continue to grow.